Ukrainians have been in the United Arab Emirates for many years - especially associated with the ongoing building boom in that country. However, only since the Revolution of Dignity that happened in Ukraine in 2014, the Ukrainian presence in the UAE has been on the rise. The first priest to serve there, Fr. George Yurchyk, shares about his experience as a pastor there and about the situation in that Middle Eastern country. Fr. 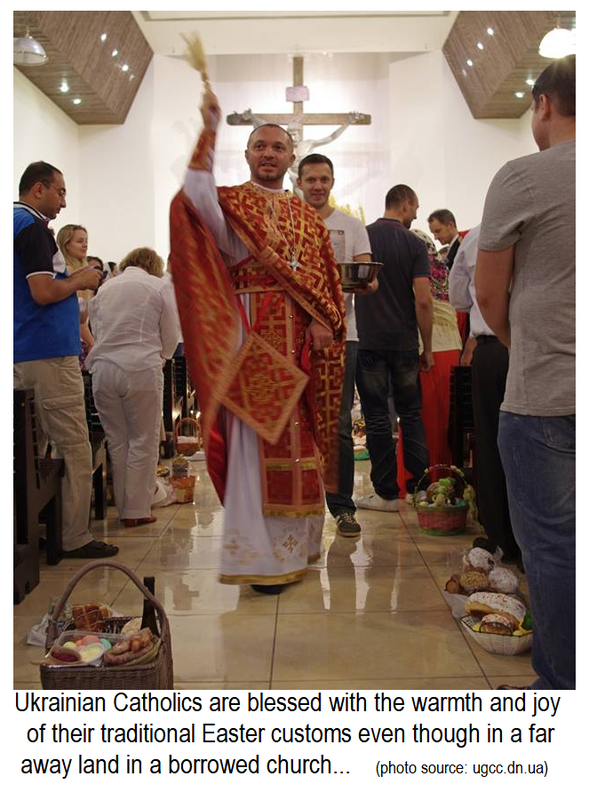 George, a priest serving in Donetsk when the Russian-backed war broke out, found it difficult – to say the least – to serve there. Around the same time, he was approached by Ukrainians from his region, who had now moved to the UAE, asking if they might receive a priest to attend to their pastoral-sacramental needs. Fr. George consulted his Bishop – Most Rev. Stephan Meniok, Bishop of Donetsk. Bishop Stephan, who was also forced from his see of Donetsk by the ongoing conflict, was supportive of the idea. In no time at all, the Head of the Ukrainian Catholic Church,* His Beatitude Sviatoslav gave his blessing and Fr. George was on his way. Another pastoral need was immediately discerned in Dubai - the Catholics from Eastern Europe also did not have a clergy to attend to their pastoral needs in their own languages and local spirit that they live their faith. Fr. George was granted bi-ritual faculties and served the Polish and Slovak Roman Catholic communities as well. Fr. Yurchyk also went to visit and give care to the Ukrainian communities in the neighbouring countries of Republic Yemen and the Sultanate of Oman. Fr. George’s missionary enthusiasm and his journey of priestly ministry is extraordinary. He was a high-ranking member of the Kyivan Patriarchate of the Ukrainian Orthodox Church serving in the Donets province of Ukraine. However, in 2009, he and a number for fellow clergy were received into full communion with the Ukrainian Catholic Church by Bishop Stephan. Since his mission adventures in the Middle East, Fr. George has returned to Ukraine to serve the faithful in the war-torn Donbas region and other clergy are being sent to continue the mission work in these Persian Gulf countries where Ukrainian communities have been formed. Although these particular countries are obviously predominantly Islamic, Fr. George found them to be very tolerant toward other religions, especially the Christian Faith. He attributes to the fact that these countries have had a great deal of collaboration with European business and building interests. Good-sized Christian populations of workers and businessmen have been present in these countries since the 1960s to help develop the oil and other resources. It is interesting to note that the practice there is there is really no immigration. People have been living there for even 40+ years. But they do so on a worker’s visa… for as long as it takes. Given this situation, could parishes per se someday be established there? This is surely something that will be decided by His Beatitude and the Synod of Bishops when they gather to deal with such questions as they will in Ukraine in September of this year. So, if you feel that you have a calling to the missions, the Church has many opportunities…. They will not be easy, for even as Fr. George says, “for a priest, the UAE is not a place for a break, but for hard work”. Also see: …. Canon 393 - Clerics, whatever their condition, are to care in their heart for the whole Church, and therefore to serve her wherever there is greatest necessity; let them show willingness, especially with the permission or encouragement of their own eparchial bishop or superior, to exercise their ministry in the missions or in regions labouring under a shortage of clergy. Canon 585 - §3. In the individual eparchies a priest is to be designated to effectively promote endeavors on behalf of the missions. §4. The Christian faithful are to promote among themselves and others knowledge and love for the missions, to pray for them, to inspire vocations and support them generously with their own means.